I recently spoke with a friend who is a fundamentalist young Earth creationist. I’ve known him for quite a few years and we get along great, despite our diametric views on religion and science. We’ve had plenty of discussions about religion, science, God, theology, and the bible and they’re always enjoyable because neither of us takes the points and counterpoints personally and we really listen (mostly) to each others’ views, even if we disagree. We also tend to toss in some humor to the mix to keep things light. We started talking about science and the age of the Earth again with another friend, though it was really late and we didn’t get into anything in great detail, but one of his comments (which he’s made before) is a common one that I find exasperating. The comment was something along the lines of "We all have the same facts. However, depending on our worldview and our assumptions, we reach different conclusions." My response was basically that the difference wasn’t a worldview or the starting assumptions. The difference was that science looks at the facts and then tries to come to a conclusion (theory) while religion starts with the conclusion already established and tries to make the facts fit. He denied that was the case (radiometric dating was the point of contention in this particular instance). Before we got any further, it was time to call it a night because we were on the verge of falling asleep anyway. What struck me as I thought about the exchange was that creationists, fundamentalists, and other groups that deny evolution or the age of the Earth, cherry pick science in much the same way that they cherry pick from the bible. They’ll trust science when it comes to medicine, happily going to the doctor for a prescription or to the hospital for surgery. They’ll trust science when it comes to the manufacture and operation of cars, trains, and airplanes when they want to go to work or on vacation. They’ll trust science when it provides them with a television signal or allows them to download new music for their iPods. They’ll trust science when it provides them with an inexpensive abundance of biologically improved crops, meat, and dairy products for their backyard barbecues. They’ll trust and depend on science when it comes to the manufacture of their footwear, clothing, homes, automobiles, medicine, televisions, computers, appliances, cell phones, and a myriad of other things that don’t conflict with their fundamentalist theology… but if there’s a conflict, science is suddenly a flawed methodology where facts are interpreted differently due to worldviews, preconceptions, and baseless assumptions. It’s hypocritical and it’s an insult to the scientific community. To be so cavalier in dismissing some of the most well-supported scientific theories in the history of science, yet depend upon science for their entertainment, convenience, and sometimes even their very survival, seems to me an irrational position at best. 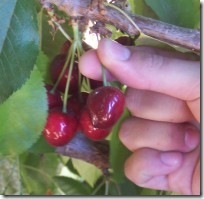 But I suppose that’s what cherry picking is all about. Posted in: Featured Articles, Science. These people like to cherry pick science when it is convenient for them, and they cherry pick religion when it’s convenient for them. They have the best of both worlds. Get 1000 people and have half of them go 100% devotion to science and the other half 100% devotion to religion. The science people cannot do or use anything related to religion. The religion people cannot do or use anything created by science. Just for the sake of argument, we have two identical large islands in the middle of the ocean. They are not connected in any way and people can’t get to the other island. Each island has no influence whatsoever on the other island. Sadly, Religion Island would still consider themselves to have led the better lives as they will feel that their supposed eternal souls have been taken care of while we over on Science Island just have a better time in this life. What do you mean by “just have a better time in this life?” If the God Hypothesis is false, then this life is all that there is. If those who embraced science lived peaceful and fruitful lives, then they were successful. It follows that the other camp is merely deluded. Although faith in some cases may bring happiness, I don’t believe that ignorance is bliss. Besides, even if the science group is wrong and there is an afterlife, it would be absurd to suggest that such a brilliant creator of the universe would punish his people for using their own rationality. It all comes down to what is the meaning of life. Life has one goal. To live. An important difference I see between humans and the rest of life on this planet, is the knowledge of our lifespan. We know we will die. It is this knowledge that pushes us to try and survive even when we know that the end is unavoidable. If you are about to be attacked by a bear, you will do anything to survive. Because that is the goal. Stay alive. So we find a way to survive, and we develop a way to live after we die. Accepting ones end as the absolute end is an incredible task. Instincts kick in and refusal to give up are at full force. The imagination throws all options at you and you will accept anything rewarding you with more life. Religion is born. So until Science offers eternal life, religion will reign supreme. But if you were to ask any religious person if they were going to have an afterlife of some form, their response would be “yes”. If a person is willing to kill themselves and thousands of others to get to the afterlife, they don’t see it as anything other than absolute truth. They have found a relief to that horrible knowledge that they will die someday. This is the driving force behind all religions, in my opinion. I agree. It offers an “answer” to the ultimate unknown. An interesting, and geeky, thought came to mind after reading my earlier reply (“until Science offers eternal life”). There’s a good chance that in our lifetime we will have the option to download our mind onto a storage device. Forgive me, I know this sounds .. but anyways, it brings up an interesting question. If Science DID happen to give people the option to continue living past what their body would allow, would religion fade? I choose God and true biblical religion over any and everthing this world has to offer. I don’t have to worry about downloading my memory to a disk before I die because my Creator God has kept an account of my life. I don’t need to kill anyone or pay money or anything else to have eternal life. These actions are not God’s will. He is against murder and wrong doings. He can’t be bought for He owns it all. In order to get God’s reward, all I have to do is humble myself before Him. His Word, the Bible, is true and His Word tells me to repent of my sins and seek His will. Why would I want to do anything else? God’s inheritance for me is grander than this world and everlasting. Words cannot describe the things He has prepared for those who love Him. To be with Jesus for all eternity, the one who loves me and died for my sins, is beyond riches. Death does not scare me because my Lord and Savior will raise me from the dead to eternal life with Him in paradise. My hope is not in man, but in the one who made man. I encourage you to think outside of your own abilities and the abilities of other humans. God has so much more to offer than anything or person here in this life.